Calcareous sandy soils in arid regions suffer from poor productivity because their low organic matter-content and low-water retention beside their poverty and low availability of most nutrients such as phosphorus, nitrogen, potassium and some micronutrients (Brady and Weil, 1999). Therefore, to increase the productivity of these soils, it is preferable to use biochar as an organic amendment. Biochar plays an important role in the environmental management via improving soil properties, waste management, climate change mitigation and nutrient pollution, as well as energy production (Lehmann and Joseph, 2015). Biochar improves physical properties of soil, such as water holding capacity and soil aggregation (Obia et al.,2016; Curaqueo et al., 2014). It also recovers soil chemical properties such as organic carbon (Ippolito et al., 2016). Therefore, it increases the soil cation exchange capacity (Mohamed et al., 2016), thus increases nutrients against leaching and makes some of them more available to plants e.g., N, P and K (Amin, 2016; Gao et al., 2016;Muhammad et al., 2016; Shen et al.,2016). Hence, the biochar can be used as a substitute for phosphate fertilizers when reclaiming calcareous sandy soils because of its high content of P (0.6 to 3.2 g kg‒1) that amount depends on the type of plant residues (Shenbagavalli and Mahimairaja, 2012). The incorporation of biochar with sandy soils results an increase in ammonium and nitrate retention and a reduction of nitrogen loss by leaching (Yao et al., 2012; Cao et al., 2017), and N2O emissions (Wu et al., 2013). So, it enhances the nitrogen use efficiency of plants grown in a sandy soil (Van Zwieten et al., 2010). Thus, the germination of seed, plant growth, and crop yield of some plants significantly increase with applying biochars to soils (Glaser et al., 2002). The main objective of the current study is to investigate the effects of biochar (B) prepared from maize stalks on soil organic matter, fruit yield as well as N and P use ofefficiencies of zucchini (Cucurbita pepo L. var. Hybrid fadwa) plants grown in a calcareous sandy soil. The biochar was prepared via collecting dry maize stalks of the experimental farm of Assiut University, Assiut, Egypt. Maize stalks were cut into pieces about 30 cm length and burned in the absence (or reduced supply) of air at temperature about 400 °C. Then, the produced biochar was crushed by a stainless steel mill. 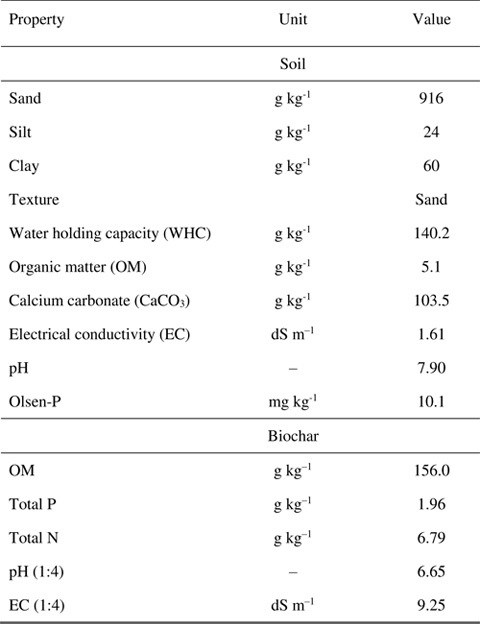 Some physical and chemical properties of this biochar are shown in Table 1. This study aimed to investigate the influence of this biochar on the soil organic matter and yield of zucchini grown in a calcareous sandy soil. The soil under study was collected from the surface layer (0-20 cm) of El-Qussia, Assiut, Egypt. It is classified as TypicTorripsamments according to the U.S. Soil Taxonomy. The chemical and physical characteristics of this soil are also shown in Table 1. The collected soil sample was air-dried and crushed to pass through a 2-mm sieve before use in the pot experiment. Three kilogram portions of the soil were packed uniformly in plastic pots. The biochar was added to the pots at levels of 0 (control, unamended soil), 6.3 (B1), 12.6 (B2), and 25.5 (B3) g pot‒1 and thoroughly mixed with the soil. These levels of biochar were selected according to its content of phosphorus (P).This pot experiment was carried out in a complete randomized design with three replications. Three seeds of zucchini (Cucurbita pepo L. var. Hybrid fadwa) were sown in each pot on November 17, 2016. All pots were irrigated by tap water at field capacity and fertilized with irrigation water. After germination, the plants were thinned to two plants in each pot. Nitrogen (N) was added to each pot as urea (46 % N) at a level of 84 mg N pot‒1 after 20 days of sowing. Zucchini plants were also fertilized by nitrogen and potassium in the form of potassium nitrate at alevel of 1.64 g pot‒1 in three doses: the first dose after 33 days from sowing, is 650 mg potassium nitrate pot‒1, the seconed dose after 53 days from sowing, is 336 mg potassium nitrate pot‒1 and the third dose after 76 days from sowing, is 650 mg potassium nitrate pot‒1. However, phosphate fertilization was satisfied with biochar substitution. Zucchini plants were harvested after 104 days of planting. Thereafter, the fresh fruit and shoot weights of the plants as well as the oven dried fruit and shoot weights at 70° C were estimated in each pot (g pot‒1). Then, soil and plant samples were taken from each at harvest for analysis. Water holding capacity (WHC) of the soil was estimated by the gravimetric method according to Mohamed et al. (2016). Soil pH was determined in a 1:1 suspension of a soil to distilled water, while the pH of the biochar was measured in a 1:4 suspension using a glass electrode (Jackson, 1973). The electrical conductivity (EC) was measured in a 1:1 soil extract and1:4 biochar extract was determined using an electrical conductivity meter (Hesse, 1998). The organic matter (OM) contents of the soil and biochar were determined by WalkleyBlack method (Jackson, 1973). The total nitrogen and phosphorus in the dreied fruit and shoot of plant samples were determined after the digestion by a mixture of sulfuric (H2SO4) and perchloric (HC1O4) acids. The phosphorous (P) content in the digests was determined colorimetrically using the chlorostannous phosphomolibdic acid method as described by Jackson (1973). However, the total nitrogen (N) in the digests was determined by the micro-kjeldahl method (Jackson, 1973). The calculation of the nutrient use effeicincy was assessed according to (Baligar et al., 2001; Mosier et al., 2004; Dobermann, 2005). The nutrient use efficiency can be expressed by several agronomic indicessuch as a partial factor productivity (PFP) or nutrient use efficiency in kg crop yield per kg nutrient applied or as an agronomic efficiency (AE) in kg crop yield increase per kg of applied nutrient. All data were analysed by one-way analysis of variance using MSTAT program. Treatment means were compared using Tukey,s testat at the 5% probability level for the main effects of biochar (Steel and Torrie, 1982). The addition of biochar to the calcareous sandy soil caused a significant enhancement in the soil organic matter (SOM) content. Relative to the control, the SOM increased by 3.3, 10.7 and 22.8 % with the biochar addition at a level of B1, B2 and B3, respectively (Table 2). Different capital letters within columns show significant differences between treatments at the 5% probability level by Tukey,s test. Fresh and dry weights of zucchini fruits significantly increased owing to the applications of biochar treatments to the calcareous sandy soil (Table 2). These increases became more obvious with incrasing biochar applied levels. Compared to the control, the biochar treatments of B1, B2 and B3 resulted in an increase in the fresh weight of zucchini fruit by 26.7, 55, and 195.0 %, respectively. For zucchini dry fruits weight, the respective increase were 8.0, 47.0 and 150.8 % owing to the above mentioned levels. Biochar application showed also a significant increases in the fresh and dry shoots of zucchiniplants. In addition, the relative increase in the fresh shoot over the control was 11.6, 17.8, and 18.5 % for B1, B2 and B3treatments, respectively. Moreover, the applied biochar levels increased dry shoot over the control by more pronounced percentages reached 22.5, 31.7 and 16.7 % for B1, B2 and B3, respectively (Table 2). The real improvement in the zucchinifruit yield may be attributed to the availability of the nutreints in presence of biochar. The B1 treatment of biochar exhibited a significant incearese in the nitrogen content of zucchini fruits, while, the B3 treatment showed a significant decearese in this parameter (Table 2). The nitrogen content of the fruits increased from 25.5 g kg‒1 for the control to 35.5 g kg‒1 with applying B1 treatment. On the other hand, applying biochar at B2 and B3 levels reduced the nitrogen content of the fruits to 23.6 and 22.0 g kg‒1, respectively. The effect of biochar additions on shoot nitrogen content was insignificant. Biochar additions at B1 and B3 treatments significantly decearesed the phosphorus content of zucchini fruits. 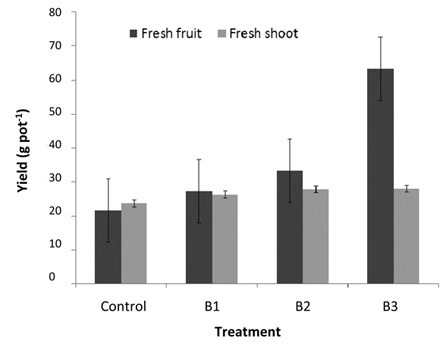 In contrast, the B2 treatment showed an in significant incearese in the phosphorus content of fruits. Thus, the phosphorus content of the fruits decreased from 2.94 g kg‒1 for the control to 2.26 and 2.25 g kg‒1 for B1 and B3 treatments, respectively. 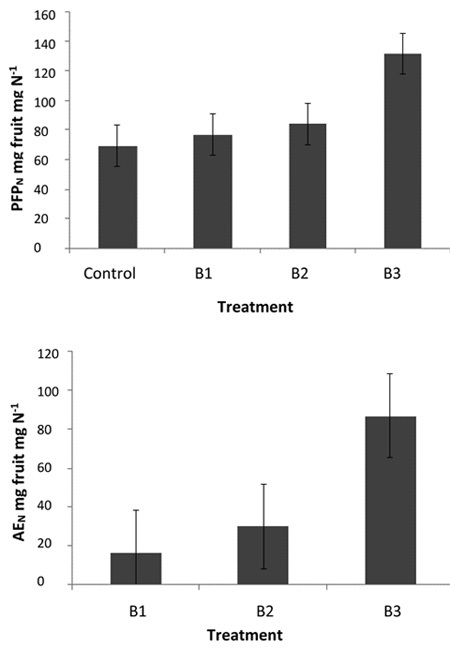 On the other hand, applying biochar at B2 level increased phosphorus content in fruit from 2.94 g kg‒1 (control) to 3.03 g kg‒1. The shoot phosphorus content was significantly enhanced with biochar additions. It was raised from 0.92g kg‒1 for the control to 1.13, 1.35 and 1.08 g kg‒1 for B1, B2 and B3 levels, respectively. The fruit and shoot nitrogen uptakes by zucchini plants significantly increased due to biochar additions (Table 3).The addition of biochar led to increases in fruit nitrogen uptake from 31.7 mg pot‒1 for the control to 47.4, 43.1 and 68.8 mg pot‒1 for B1, B2 and B3 treatments, respectively. Moreover, applying the biochar raised the shoot nitrogen uptake by zucchini plants from 84.1 mg pot‒1 (control) to 101.5, 104.3 and 99.4 mg pot‒1for B1, B2 and B3, respectively. Also, biochar additions to the calcareous sandy soil significantly increase both fruit and shoot phosphorus uptakes byzucchini plants. The fruit phosphorus uptake increased from 3.67 mg pot‒1for the control to 5.53 and 7.03 mg pot‒1 for B2 and B3 treatments, respectively. The shoot phosphorus uptake also extended from 3.67 mg pot‒1 for the control to 5.57, 7.13 and 5.03 mg pot‒1 for B1, B2 and B3 treatments, respectively (Table 3). Values are mean ±standard error. The partial factor productivity of applied nitrogen (PFPN) or the nitrogen use efficiency (NUE) by zucchini fruits significantly improved due to the biochar application compared to the control treatment (Table 4). It increased from 69.2 mg fruit/mg N for thecontrol to 77.1, 84.3 and 131.4 mg fruit/mg N for B1, B2 and B3 treatments, respectively (Table 4). The highest PFPN value in this study was noticed for the highest added level of biochar (B3). The agronomic efficiency of the applied nitrogen (AEN) was significantly improved with applying the biochar treatments to the calcareous sandy soil. It raised from 16.3mg fruit/mg N for B1 treatment to 30.0 and 86.9 mg fruit/mg N for B2 and B3 treatments, respectively (Table 4). Table 4.The partial factor productivity of the applied nitrogen(PFPN) and phosphorus (PFPP) and the agronomic efficiencies of the applied nitrogen (AEN) and phosphorus (AEP) of zucchini fruits as a result of biochar treatments. The partial factor productivity of the applied phosphorus (PFPP) of zucchini fruits insignificantly decreased with applying biochar. However, the agronomic efficiency of the applied phosphorus insignificantly increased with biochar additions (Table 4). In the presesnt study, the incorporation of biochar with the calcareous sandy soil increased SOM because biochar contains a high organic carbon content. Many researchers found that the application of biochar to the calcareous sandy soils increased SOM (Amin, 2016; Khadem and Raiesi, 2017). The fruit yield of zucchini improved in the presence of biochar and increased with increasing the biochar level (Figure 1). The increases in fruit and shoot yields might be due to biochar's rich content of essential nutrients esspcially nitrogen and phosphorus. A significant increase in the fresh weight of squash occurred with increasing the addition level of compost compared to the unamended soil (Tartoura and Youssef, 2011). Nitrogen fertilization showed a significant increasein the fruit yield and fruit numbers of squash (Mohammad, 2004). Phosphorus and zinc applications gave an enhancement of fresh and dry weights of zucchini fruits probably because phosphorus and zincplay a vital role in the enzymes activity of the biological plant processes (Shawer and Rizk, 2012). Nitrogen and phosphorus content of the squash fruits significantly improved with phosphorus fertilization (Shawer and Rizk, 2012). Additions of the green manure to the soil gave an increasein the total N accumulated in the zucchini plants (Vargas et al., 2017). In addition, the nitrogen and phosphorus uptakesbysquash fruitswere significantly enhanced with phosphorus application (Shawer and Rizk, 2012). Figure 1. Trends of fresh fruit and shoot of zucchini plantswith adding biochar treatments [Control (unamended soil), B1 (6.3 g pot‒1), B2 (12.6 g pot‒1), and B3 (25.5 g pot‒1)] to calcareous sandy soil. The nutrient use efficiency is a function of the capacity of a soil to supply sufficient levels of a nutrient and the ability of plants to uptake it (Baligar et al., 2001). These results have demonstrated that the biochar additions to the calcareous sandy soil increase the partial factor productivity of applied nitrogen (PFPN) and the agronomic efficiency of the applied nitrogen (AEN) of zucchini plants (Figure 2). On the other hand, they showedinsignificant effects on the partial factor productivity of the applied phosphorus (PFPP) and the agronomic efficiency of the applied phosphorus (AEP). Improving the use efficiency of the applied N fertilizer with the biochar additions could be resulted from increasing N retention and uptake by plant biomass (Steiner et al., 2008). The use efficiency of the applied N fertilizer was enhanced because the addition of biochar to the soil reduced the N2O gas emissions and, in turn, increased the available nitrogen for plants (Case et al., 2015). Increasing the uptake and utilization of nutrients by plants improves the use efficiency of the applied fertilizers, reduces the cost of inputs, and preventes the nutrient loss to ecosystems (Baligar et al., 2001). The application of organic manures to the soils causes increased in SOM, increased water holding capacity and aggregation stability, resulting in nutrient leaching reductions and improving the nutrient use efficiency (Baligar et al., 2001). Figure 2. Effect of biochar treatments(B1, 6.3 g pot‒1, B2, 12.6 g pot‒1, and B3, 25.5 g pot‒1) on the partial factor productivity of applied nitrogen(PFPN) and the agronomic efficiency of applied nitrogen (AEN) for zucchini fruits grown in calcareous sandy soil. This study was established to evaluate the role of biochar addition in improving the calcareous sandy soil productivity because of several benefites of biochar for soils and enviroment. The results showed a high ability of biochar to enhance soil organic matter content and zucchinifruit yield. Furthermore, biochar additions increased N and P use efficiencies. It could be concluded that biochar could use as a soil amendment to improve the productivity of calcareous sandy soil. Mosier, A.R., Syers, J.K., Freney, J.R. 2004. Agriculture and the Nitrogen Cycle. Assessing the Impacts of Fertilizer Use on Food Production and the Environment. Scope-65. Island Press, London.